A booming hotspot in the 1950s, North Melbourne flourished for its prime location near the city centre. Today, the action is going down in its own backyard! There are lots of reasons to stay in one of our North Melbourne hotels, with a suitcase full of foodie, retail and theatrical experiences just waiting for you to dig through. One of Melbourne’s most dynamic suburbs, a short wander will lead you down tree-lined streets, past Victorian-era homes and into sprawling food precincts that are sure to tempt. North Melbourne’s biggest claim to fame is easily the Queen Victoria Market. A historic landmark for the city, it’s vibrant and bursting with fresh produce, gourmet foods, clothes and souvenirs. Another local hotspot, the North Melbourne Market, is a unique one-stop shop for vintage pieces, fairtrade fashion and local works spanning all things creative. Far from the finds of mainstream shopping, one-off retail outlets offer unique shopping experiences throughout North Melbourne that you won’t find elsewhere. Popular streets such as Errol Street, Victoria Street, and Queensberry Street incubate the local food scene. Take your fork to one of the many Italian, Malaysian and Japanese local eats, or bask in the sun in an alfresco cafe. Come night, and the relaxed atmosphere gets lively. Whether you prefer beer or coffee, there’s a tonne of options to whet your appetite. If it’s entertainment you’re looking for, be sure to explore the contemporary program offered by Arts House. For the light-hearted, The Comics Lounge might be just what you’re looking for. Funny all year round, it also plays host to the laughs and shenanigans of the Melbourne International Comedy Festival each year. For something a bit more peaceful, the greenery of Royal Park is a great spot to escape the bustle of Melbourne. Home to the State Netball and Hockey Centre, and the Royal Park Golf Club, there’s more than just nature on its doorstep. With Kensington not far away either – with its leafy streets and cosy setting – you’ll never get bored in this part of town. To get around North Melbourne, walking on foot is the best way to really explore. But if your feet tire fast, don’t fret. You can jump on a tram, a bus or a train to get to your destination. For those who want something in between – Melbourne’s Bike Share system is the answer to quick trips around the city. 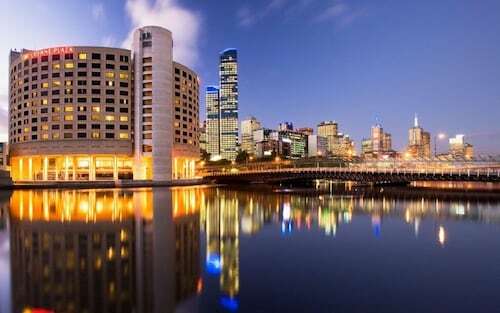 Pick-up and drop-off points are conveniently located all around Melbourne, making the journey itself as much fun as the destination. North Melbourne is a great spot to base yourself when you come to Melbourne – and it has its own distinct character to explore. So wot are you waiting for? 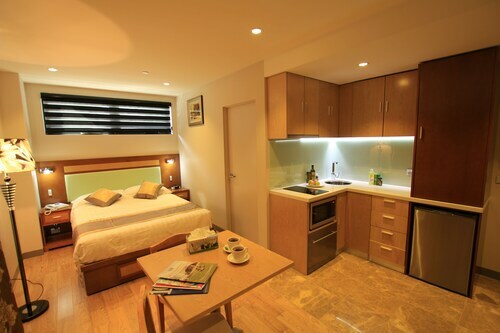 From hostels to self-catered apartments and four star hotels, browse our North Melbourne accommodation options now. Need insider tips on must-see attractions in North Melbourne? Check out our North Melbourne travel guide! How Much is a Hotel Room in North Melbourne? Hotels in North Melbourne start at AU$62 per night. Prices and availability subject to change. Additional terms may apply. The location was perfect for us. A nice walk to shops. Lovely touches for guests. All the facilities we could want. Very clean and comfortable. Communication was great eg instructions for after hours arrival.